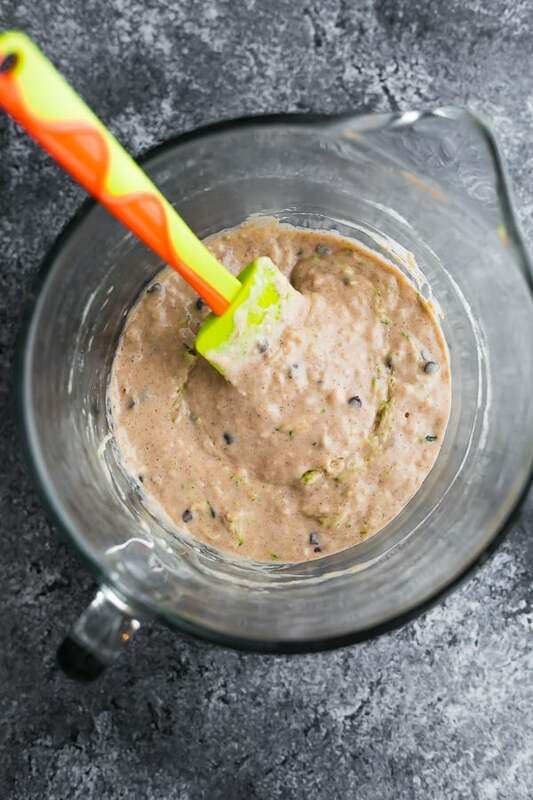 Zucchini chocolate chip pancakes that are easy to make and the perfect way to sneak some veggies into your kids! Perfectly fluffy, slightly sweet and so delicious! 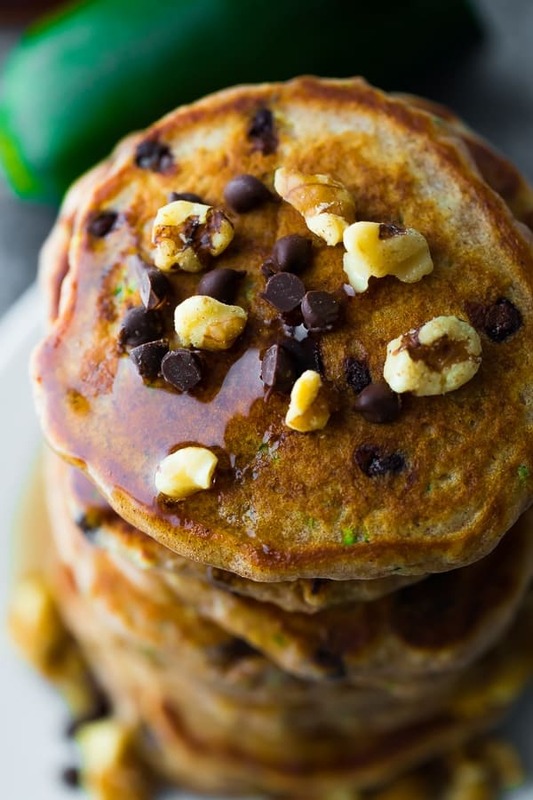 Breakfast is served, and it’s a great big stack of fluffy zucchini chocolate chip pancakes! Not only are these a personal favorite, but they are loved by kids too…even my discerning 5 year old who can spot a little green something in his pancake from a mile away. you can make them ahead and reheat for easy breakfasts! 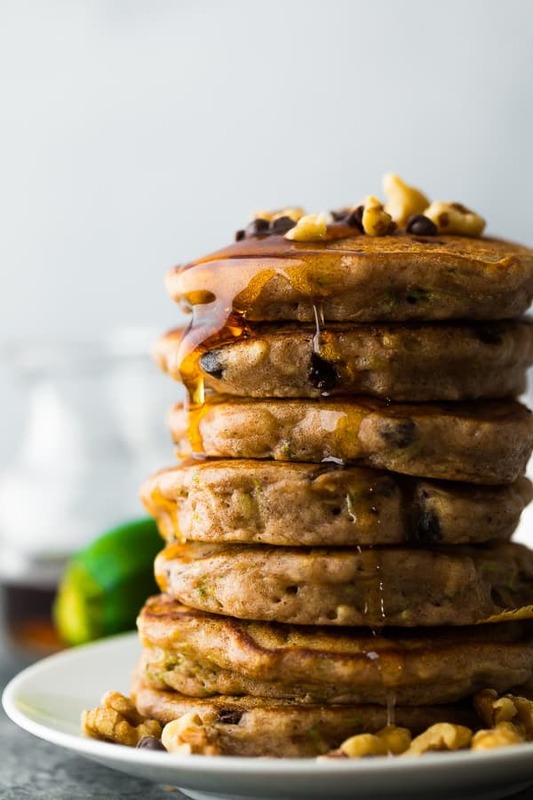 Are zucchini pancakes healthy? These pancakes contain little oil and a full cup of shredded zucchini, so I do consider them to be on the healthy side. You can also swap the all purpose flour for white whole wheat flour to make them even healthier! Can I use almond/coconut/gluten-free/alternative flour for these pancakes? I have not tested any alternative flours in these zucchini pancakes. I have tried with white whole wheat and they worked perfectly! 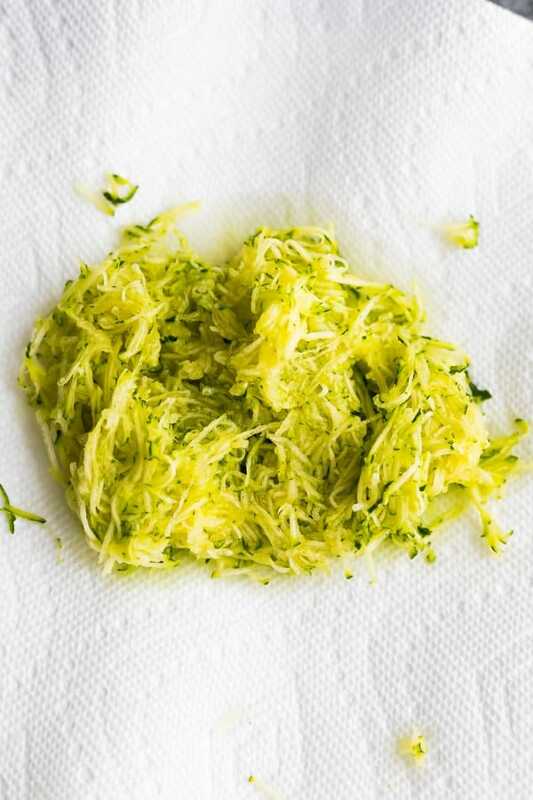 Can this zucchini pancakes recipe be frozen? Yes! We stacked them in a glass meal prep container with a bit of wax or parchment paper between each pancake. When you want to heat up, thaw at room temp for a few hours, then place in the toaster. 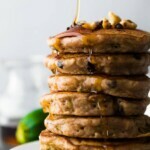 Can I veganize this zucchini pancakes recipe? You can swap the milk for almond milk no problem, and the pancakes work with a flax egg but the texture is NOT the same. It ends up thick and kind of gummy. For best results I recommend using a real egg. 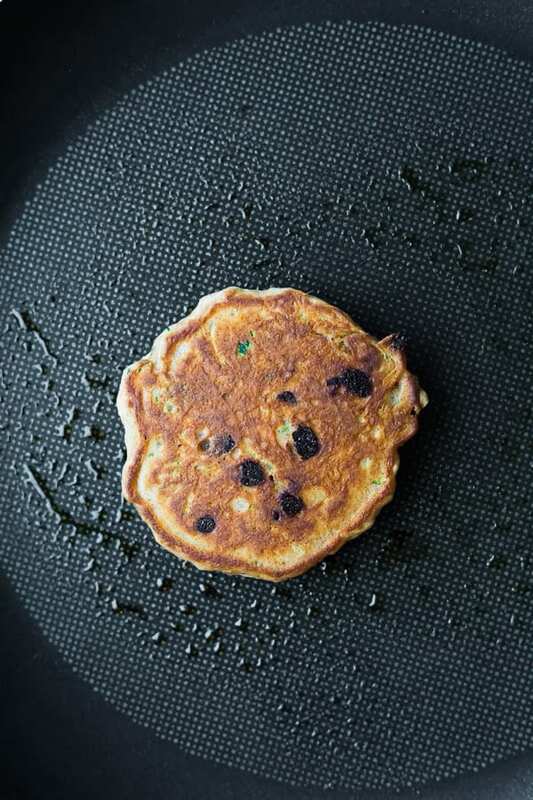 OK if you’re like me, you might get ‘pancake flipping anxiety’…aka you get so up in your own head that you are doomed to screw up flipping these zucchini chocolate chip pancakes. 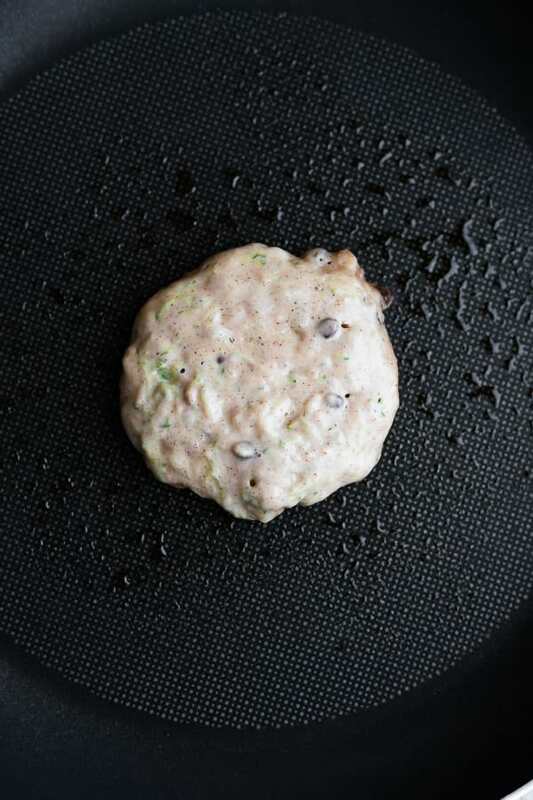 I hope these pancake flipping tips help you with this zucchini chocolate chip pancake recipe! 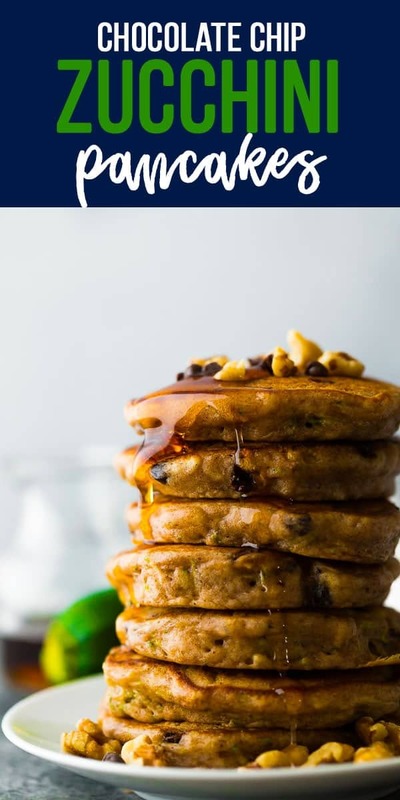 Let me know if you have an awesome tip for flipping pancakes in the comments below! 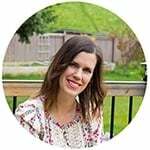 Melt coconut oil in a large microwave-safe bowl or measuring cup. Stir in the maple syrup, milk, egg and vanilla extract, and mix until smooth. Add the flour, baking powder, baking soda and cinnamon and mix into the batter until no flour clumps remain. Fold in the mini chocolate chips and shredded zucchini. Add some spray oil to the pan, then measure out 1/4 cup portions of pancakes. Cook for around 2 minutes on the first side, then flip and cook 1 minute on the second side. Enjoy with walnuts, syrup and extra chocolate chips. Store in the fridge for up to 4 days. Freeze for up to 3 months. Reheat in a pan, or in the toaster.